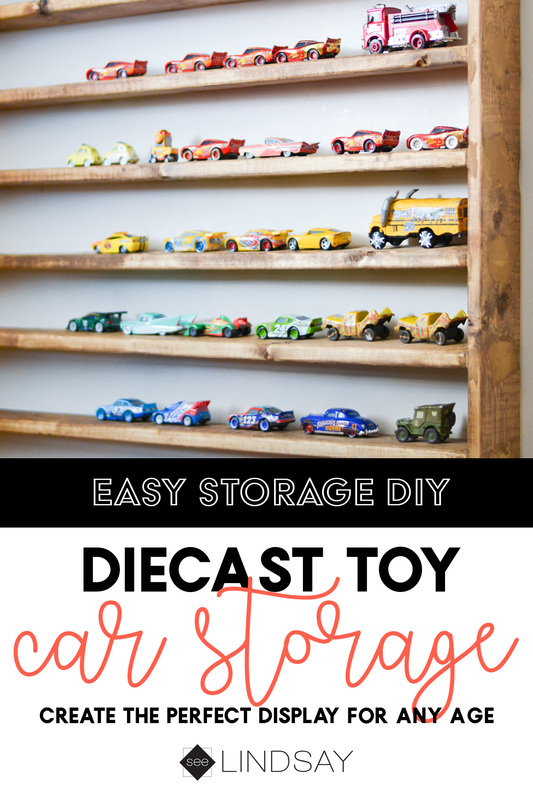 DIY Hot Wheels Storage & Display for all your Die Cast Cars! 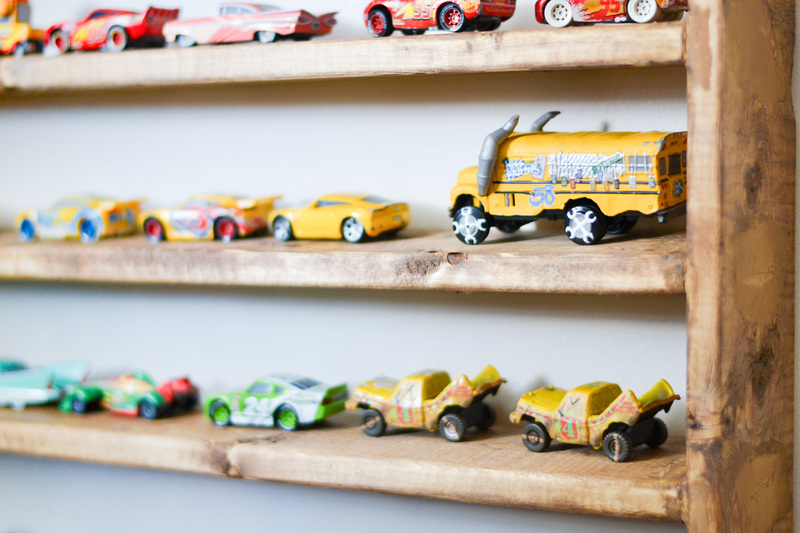 Is your child obsessed with Matchbox Cars and you don’t know where to put them? 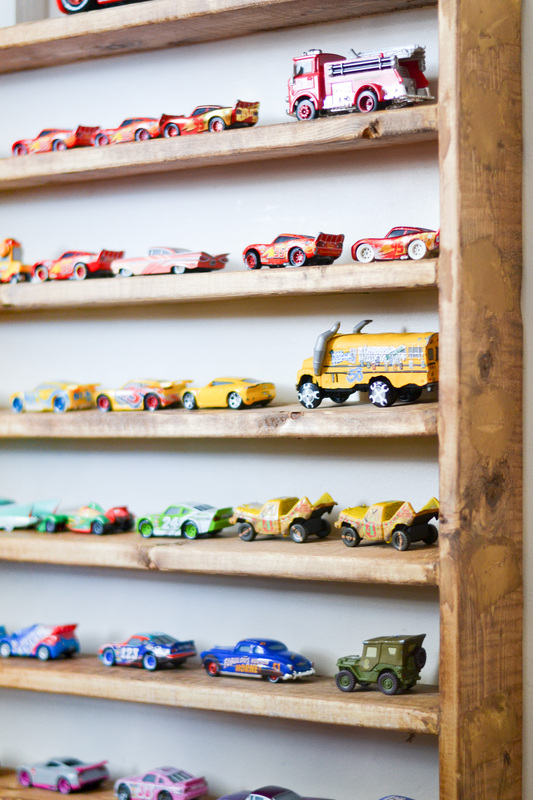 I’ve got an easy way to make your own Hot Wheels storage display that any cars crazed kid will love. 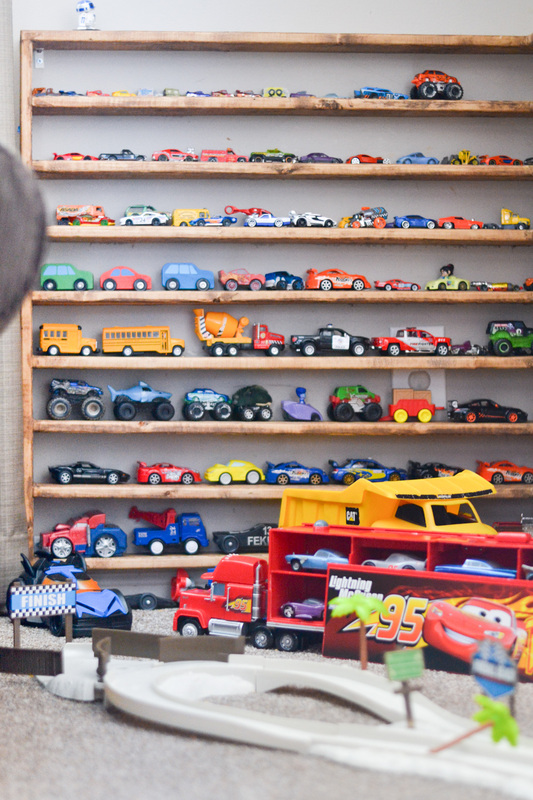 Malakai is crazy for his cars and he has a bit of OCD tendencies when he wants to arrange them. They’ve got to be facing the correct way and he wants to know they’re going to stay that way. My husband and I came up with this toy car storage solution so that I won’t have cars all over my desk and they can be displayed just how he likes them. 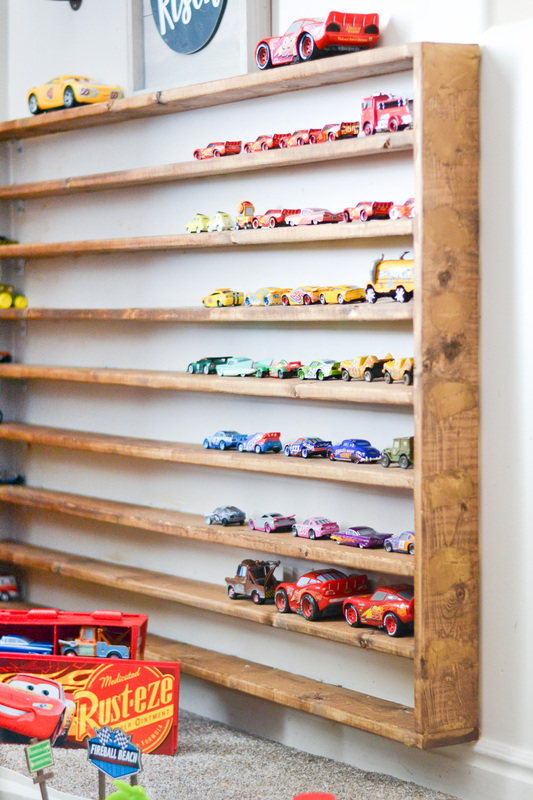 Create this Hot Wheels storage to make your life a little easier like it’s made mine. If you didn’t know, Malakai was born premature so he really does have OCD tendencies when it comes to really anything. He will cry for longer than I like to admit and so for my sanity this had to happen. We also have about a 1500 sq. ft. house and so a large toy car storage solution isn’t very practical for us. We used some inexpensive 3X.5″ planks and some L brackets to set this up. My husband also decided to give his brother my Ryobi nail gun so this was done the old-fashioned way with some nails and good ole elbow grease and some math. I’m glad it’s up though because his toy cars were getting out of control. We began by measuring the small area of our corner. Our cutout on this wall is 34″ high and so we began by figuring out how high we wanted it to go. I didn’t want it to be exactly where the wall cut off so we measured and cut two boards 32″ high as our endcaps. We then measured how wide we needed the wooden planks for your car toy display. The other side of this corner wall is a large window so one side was longer than the other. The width on the smaller length of the wall is 34″ wide and on the longer side we cut the boards to be 50″ wide. Cut your wood planks to those lengths and then cut one side on each board on a 45-degree angle to create the corner pieces and so that they’ll match flush. 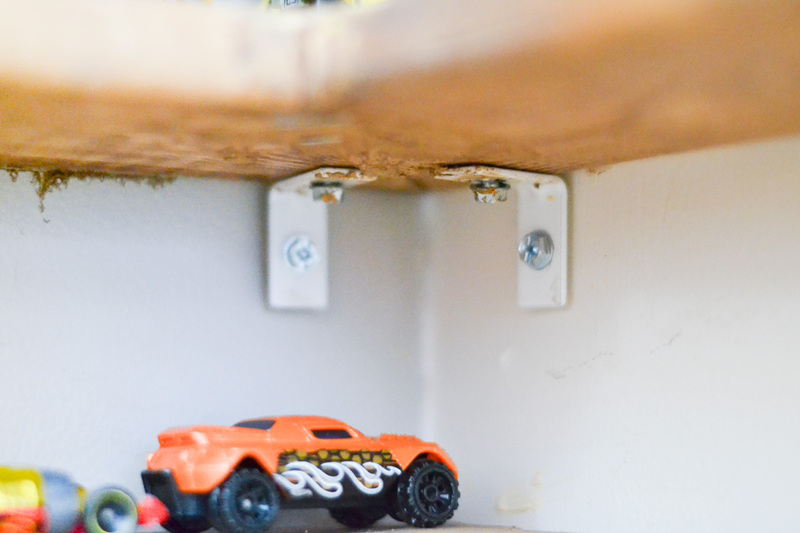 The base of our toy car display is right on top of our baseboard. He can have cars on the floor and then build up the car display case and place them on each shelf having their eyes look right at him and he’s as content as can be. In the corners, we used the L Brackets so that the boards would not bend and they were supported. You can use a Kreg Jig but don’t ask me how to do it. This isn’t so much a permanent fixture in our home so I wanted it just to be up and something that can easily be taken down for when we move. Secure one side of the bracket to the board before you assemble completely. Put two on each corner piece. Each board is 3″‘ apart, Use some finishing nails and secure the wooden planks together and then use your wood filler to fill in the nail hole and seams. Wait for it to dry and then sand the wood filler as smooth as possible. Use a mouse sander because that’ll cut your time in half with that tool alone. One thing we didn’t do while it was off the wall was stained it and that was the worst mistake we made. Stain your wood using some mixed stain and a cheesecloth. Wipe it on your wood and let it sit for a few minutes then wipe with a clean cloth. These prize ribbons were really easy to make using my Cricut machine. These are perfect inexpensive teacher gifts. This post contains affiliate links. Thank you for your support. 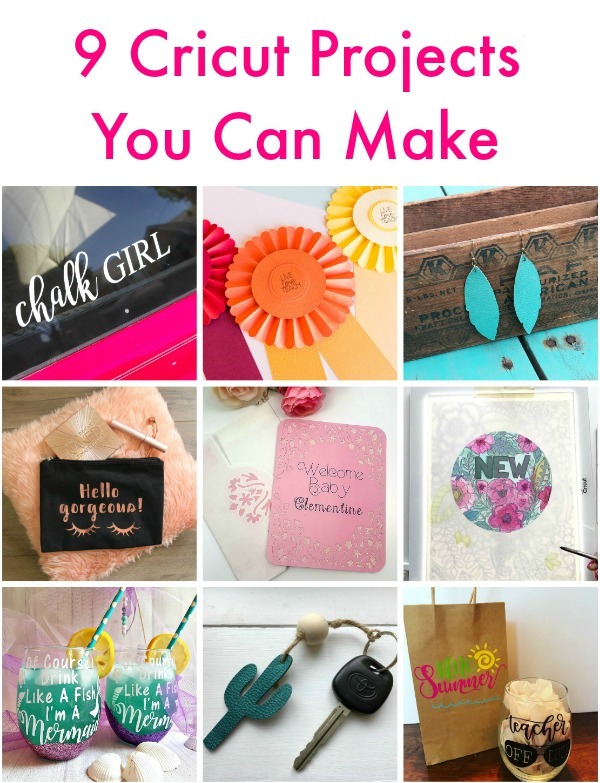 Here are some great ideas for a teacher appreciation gift using your Cricut. To create this teacher Cricut prize ribbon, you’re only going to need a few supplies and no extra tools from your Cricut machine. Just use a pen and the machine along with adhesive and you have the perfect teacher appreciation gift made with your Cricut. 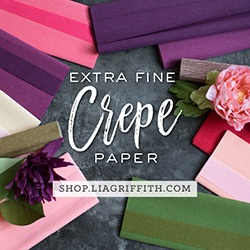 Open your Cricut Design Space file and cut you’ll need a coordinating Cricut pen to do the writing portion of the Cricut prize ribbon. I just used black for all of them but you can certainly change it up. I love how my Cricut cut these prize ribbons. I get a crisp cut every time I use my Cricut and it’s been the best investment I’ve made when it comes to Crafting. Assembling this project was really easy. This has cut lines on the ribbon rather than score lines so you don’t need any additional Cricut tools to make this. Start by accordion folding your rosette of the prize ribbon. Use some scor-tape and attach the ends together. You’ll then be able to carefully press down the middle of the rosette and it will form right away. Use some hot glue and place some in the center of your Cricut prize ribbon rosette. Allow that to harden and then use either more hot glue or some scor-tape to attach the rest of your design. I used hot glue on the tails and on the first layer of the middle of the prize ribbon. I was able to use the scor-tape on the other parts of the rosette. Attach a fun gift card to the prize ribbons or just give it straight to your teacher for a job well done. Avengers: Infinity War was released two weeks ago and I’m still healing from the ending. Make these Avenger Cupcakes and create these super cute Avenger Cupcake Picks using your Cricut. This post contains affiliate links. I receive a small commision at no extra cost to you. Thank you for your support. Have you seen Avengers: Infinity War yet? I’ll be honest, these movies don’t get me super hyped but I do love them and I really loved this one. My boys love them the most and Malakai has been asking me to open these cool Avengers LEGOs for weeks. I decided just some store bought cupcakes would be perfect for these Avenger cupcake picks and we could celebrate him finally being able to open the box ;). The bond between Thor, Groot and Rocket was created during this movie so I had to have this Lego set. This is probably my favorite scene of the movie where they create Thor’s axe and he has a new weapon to celebrate. Use these cupcake picks to make the coolest Avengers party with all the character s. They’re on the Kawaii Avengers digital cartridge available with Cricut. I used the Print Then Cut method on printable vinyl, then I layered them on some black cardstock. I used my Xyron to run the cardstock through the Creative Station and sandwiched a toothpick in the middle and placed the backside to the frontend of the matching Avenger. After you’ve printed your Avenger Cupcake Picks, lay them on the coinciding black cardstock cut out. Place your figures on to your Xyron Creative Station and run it through. If you don’t have one, just use some glue. Place your toothpick on one the front end of your Avenger and then place the backside of him and sandwich it together. Super easy. I bought these store-bought cupcakes and then used some superhero sprinkles that I found at Bakers Party Shop. Just place your Avengers Cupcake Picks into the center of each cupcake and you’re set for the party! What Malakai and I loved most about this day was opening his new LEGO Avengers set. He was in heaven creating this and was all hands on deck. My OCD came out to play with him on this day but he was more than happy so I had to just roll with it. 😉 Grab the LEGO Avengers sets here or stop by your local LEGO store. Have fun with your Avengers Celebration! Create this DIY Box Tops Collection Box to keep track of all your earnings for your local school. Get them on participating boxes of General Mills available at Walmart. Buy: Find offers. Buy Products. Earn Watch earnings stack up. You can earn Bonus Box Tops in the Box Tops Bonus App in combination with the on-pack Box Tops clips and any other coupon, discount, store program or promotion. Box Tops for Education has helped our school in so many ways. It may seem small but when everyone gets together and collects them, it adds up in a big way! Now if you buy 5 participating items + Scan receipt with Box Tops Bonus App = Earn $5 (50 Bonus Box Tops). Offer available through 1/31/18. What is your favorite way to collect Box Tops for Education? Thank you Goliath Games for sponsoring this post. Pick up your favorite game today to enjoy the holiday season and beyond! We love a good game night in our family. 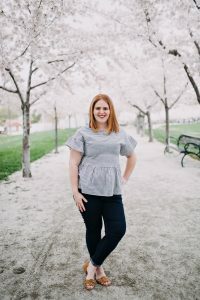 I’m here to show you how to memorable game night for kids in any age group.When game night comes in our family, we get really excited. When we get to spend quality time together laughing and making memories it makes us remember the more important things in life, like each other. When I have a stressful day with the kids, I have to find a way for them and myself to unwind. Goliath Games and Pressman Toy are just the items we need. They’re easy to play, easy to clean and a lot of fun for everyone. When having a game night, the most important thing to remember is to have fun! My personality isn’t always suited for fun but these games bring out the best in me. Shark Bite is made by Pressman Toy and was so easy to set up and play. The kids had a REEL-ly fun time trying to pick up different fishes with the rod and always wondering when the shark would bite. To set it up, just snap the mouth open and place the colorful sea creatures in each space until it snaps. Roll the dice and use the fishing rods to pull each creature out but watch out – you never know when Shark Bite will snap! No batteries required. Giggle Wiggle is made by Goliath Games and this one was Malakai’s favorite. Easy assembly and a blast to play. Just have the start at the bottom and race to the top to get him to hold the marbles. He moves like crazy so you’ll definitely have marbles that will fall off. Just pick them up and keep at it. I love this one because it’s a challenge to the kids and they laugh the whole time. Pop the Pig is another Goliath Games top pick. You feed him cheeseburgers and press his head until he pops! This one is a suspense the whole game – you never know when he’s going to pop. All the cheeseburgers store in a compartment so you don’t have to worry about losing pieces. This game teaches numbers, colors and counting and is the #2 best selling game among kids the last 6 years. Catch the Fox is made by Goliath Games and was France’s #1 toy in 2016. This one I loved cause his pants just disappear and you’re scrambling to pick up all the loose chickens. His pants are baggy enough that he’s trying to steal all the chickens in the coop. But then his pants just disappear and he’s left out in his underwear. The kids loved scrambling around trying to fill their coop with the loose chickens trying to win the game. Doggie Doo is another Goliath Games classic but now it’s been redesigned. You feed the pup and spin the wheel to determine how many times you pump his leash. Kids love the inappropriate noises the Doggie Doo makes. This game has 120 million views on YouTube already. Once the doggie goes plop, just scoop it up and start again. These games are great starters for kids of any age trying to learn strategy and competition. Goliath Games is the fourth-largest children’s game manufacturer in North America. Adi Golad started Goliath in the Netherlands in 1980 fueled by his passion to bring new toys to the market and today Goliath sells products in more than 75 countries with direct distribution in Netherlands, France, Germany, Belgium, Spain, Portugal, Poland, Australia, Canada and the USA. On July 4, 2008, Goliath opened its US subsidiary, headed by board game guru David Norman, and has been entertaining children and adults ever since. Examples include Rummikub®, Rubik’s Cube®, Tri-ominos®, Wordsearch, Pop the Pig®, Doggie Doo, Gooey Looey, and Catch the Fox. Pressman Toy Corporation, the third largest game manufacturer in the United States, was founded in 1922. The company has released many strong brands that consumers have enjoyed for generations, such as Rummikub, MASTERMIND and Tri-Ominos. One of the first companies in the industry to begin licensing popular characters and content for toys and games, Pressman Toy has created games and puzzles based on, Elf on the Shelf, Diary of a Wimpy Kid, Harry Potter as well as popular games shows Deal or No Deal, Jeopardy! and Wheel of Fortune. The company’s iconic red boxes have introduced millions of Americans to the joys of Chess, Checkers, Backgammon, Cribbage, Bingo, Dominoes, Mancala, and a host of other classic games. Pressman’s current offerings include these time-tested favorites along with a mix of exciting new games and puzzles designed to spark young imaginations and bring families together. This is the perfect classroom Halloween craft to create for your childs Halloween party. Create these different spooky suckers using napkins and Tootsie Roll pops. Thank you to Oriental Trading for sponsoring this post. I love helping in my kids’ classrooms but I especially love class parties. Halloween is always one of the best and I’m always looking for an easy craft to make with all the kids. What more do kids need on Halloween than candy? More candy! We’ve all seen those ghost suckers that are super easy but I wanted to add more characters. I decided on a witch and a bat. I’ve cut all the shapes out with my Cricut Maker but I’ve also included a template down below so that you can easily make them without an electronic cutting machine. To begin, tie all the napkins around the suckers first and attach a twine string at the base of the sucker to hold it on. Next, draw some faces. I wanted to keep it simple so I just drew an open mouth and two small eyes on the ghost. With the witch I tried to attempt a nose with a wart. Just use a fine black pen for these images. For the bat I drew some fangs using a silver marker so it would show on the black napkin. You’ll now want to assemble your witch hat. If you’re hand cutting these, don’t worry about the middle area of the base of the hat. Just place some glue on the tab and roll your hat into a cone. Now adhere it to the base. If you have the tabs, just place glue on each one and fold it under the cone. For the bat wings, just place some hot glue on the edges of the wings and place them on the sides of the sucker. You can easily have the kids cut out the shapes but for a class of almost 30 students, cutting ahead of time is a lot easier for me. Or you could just trace them beforehand as well. That’s it, the easiest kids classroom Halloween craft using suckers and napkins. Make one or make them all! Happy Halloween! Create this DIY LEGO Batman shirt using your Cricut and glow in the dark iron-on vinyl. It’s perfect for the little vigilante in your life. This post does contain affiliate links. Thank you to LEGO for sending our kids these awesome books. This post does contain affiliate links. I don’t know about you but LEGO Batman has become an essential in this house, or should I say the car? It’s pretty much the only DVD my kids want to watch in the car and because of that, I’ve become really good at quoting the movie. We took Siaki and his friends to see it when it was in theaters and I’ve never seen kids laugh louder in my life. These shirts have become their go-to wardrobe because the glow in the dark vinyl lights up for a good 5-6 hours after they’ve been playing outside all day. Go ahead and upload the LEGO Batman shirt cut file into your computer using this method. It has both images on the file so you can upload both or just one. You do that by selecting whatever part of the image you don’t want. 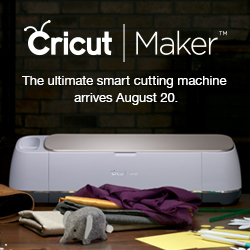 So for the words in Batman’s logo, you’re going to select it so that the Cricut will know to cut it out. This Batman cut file can be uploaded on your Silhouette but it’s been so long since I’ve done that. There are plenty of instructions on how to do that online. After you’ve uploaded your file, size it to fit the shirt. For a child large and medium, I made the file about 8.5″ wide. Set your file to cut and be sure to mirror the image for iron-on. Once your image has been cut, remove the excess iron-on material. Only leave what you want your image to be on the carrier sheet. To secure your image with an iron, follow this method. If you’re using a heat press, your temperature needs to be set for 305° and pressed for 20 seconds. Cricut has a new EasyPress and I’m excited to get my own. For now, I just used the iron. There you go. You’ve now become the coolest mom on the block cause your child has their own LEGO Batman shirt and they can put together all their LEGO Batman sets while looking good. The kids started school last week so I wanted to make Leila a customized binder with vinyl from Expressions Vinyl and put my new Cricut Maker to work. This post contains affiliate links. Thank you for your support. Click on the file to open the pre-made template using their Alpaca shape. This file is completely free and it’s adorable so it’s a win-win situation. I cut the black Alpaca’s out of the Magenta Glitter FX sheets and the pink Alpaca’s out of the gold lustre vinyl. The Glitter FX is a bit thicker than standard vinyl but it’s also a lot cushier and soft to the touch. Because of this, I did a double cut with my Cricut Maker and it peeled off very clean. It comes in other colors too and it’s a very subtle glitter look that I love. Sometimes the glitter vinyl is just pure glitter and it gets a little too busy for my taste. That’s why I love the Glitter FX and it’s even on sale at Expressions Vinyl. Once you’ve cut your shapes and you’ve peeled off the excess, unroll your transfer tape and lay the image on top of it. Doing it this opposite way will help the transfer tape from creating bubbles. Use your scraper tool and press from both sides to get a good stick. Peel away the backing slowly to insure you get all the shapes transferred. Next, lay your vinyl over your binder and use the scraper tool to get a solid stick. You’ll then grab your gold vinyl and repeat the steps so that they’ll line up and you’ll have a staggered effect on your customized binder. Next create your name in Design Space. I used the Sanies Script font to create my daughter’s name. I cut it out of the light pink permanent vinyl. Voila, you’re finished and your child is going to love their customized binder that you created using only vinyl. What type of thing will your child want on their customized binder? Or better yet, what do you want on your customized binder?